If we do that even once a day, we add to the side of the scales for good. We may not think that it counts for much but we are assured that it does. Every little thing counts. Martin Luther King Jr. said, “If I can not do great things, I can do small things in a great way.” He understood the importance of the little things. The smallest things can change a heart and make it feel good; a smile, sharing, taking in your neighbors garbage cans on garbage day, paying the toll for the person behind you, baking and taking some to a neighbor, holding the door for someone and smiling while looking them into their eyes, thanking someone while making sincere eye contact, praising someone’s effort no matter the outcome, pointing out the good, being grateful etc. You get it. It is all in the smallest details that count. 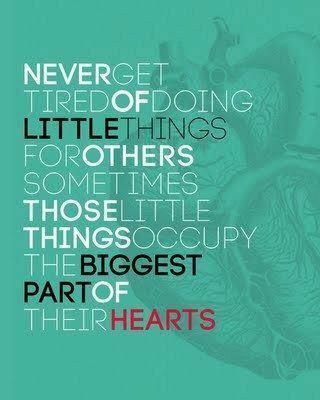 -Do little things for others. -Baking bread. Why did I ever think that would be hard? -Hearing from Jul…unsolicited. That may seem like a small step but it is huge.